The head of the Russian Orthodox Church, Patriarch Kirill, said Tuesday he was praying for the fire-ravaged Notre Dame Cathedral in Paris to be restored to its "former glory." 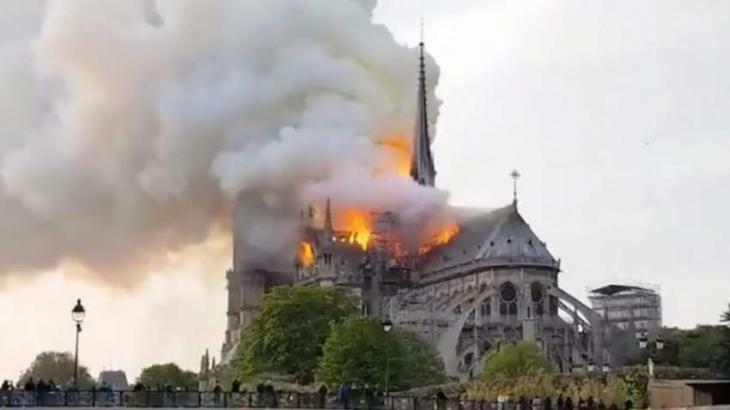 Moscow, (UrduPoint / Pakistan Point News - APP - 16th Apr, 2019 ) :The head of the Russian Orthodox Church, Patriarch Kirill, said Tuesday he was praying for the fire-ravaged Notre Dame Cathedral in Paris to be restored to its "former glory." In a letter to Paris Archbishop Michel Aupetit, the patriarch said he was "deeply saddened" by the giant fire that badly damaged the cathedral. "I offer prayers to God so that he will help overcome the consequences of the fire and restore the cathedral to its former glory in the near future," the letter, published on the Orthodox Church website, said. "I hope that the joint efforts of the church, the state and all of those that are not indifferent will be successful," Patriarch Kirill wrote. He called Notre Dame a "masterpiece of Christian cathedral architecture" and a "revered shrine of the Roman Catholic Church in France." Relations between the Orthodox and Catholic churches -- the two largest Christian denominations -- have historically been difficult. But in February 2016, Patriarch Kirill met with Pope Francis in Cuba -- the first meeting between the leaders of the two churches since their split in 1054, known as the "Great Schism".